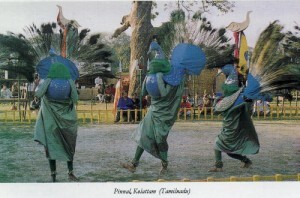 A fascinating dance of Tamil Nadu is Pinnal Kolattam. In this dance a number of differently colored ribbons hand down suspended from a fixture. The lower end of each ribbon is held by a dancer. Dancers holding the ribbons dance and move in such a way that a beautiful symmetrical braid of the ribbons gradually takes shape. Both melodic and percussion music accompany the dance with indigenous instruments.